Editing Software: Adobe Lightroom 3.6; Adobe Photoshop CS4; “onOne Presets” Volumes 1 to 3. Image Sizing: Facebook and Flickr: 900 Vertical; 1600 Horizontal. Note: for a short period, I was uploading full-sized images, just beneath 6,000-pixels-width, to Flickr, but I’ve settled on the standard noted for the web. What this means for the viewer is that when the option to see the “original” or “full-sized” image on screen, it’s really about 1/3 the image size available for the file of interest. While my XP-era technology has aged multiple computing generations, it has within the nostalgic traditions of photography — the field is famous for its leading personalities taking great leaps backwards (to wet plates, wooden boxes, FILM, for pete’s sake) to pursue their promotion of the look of having recorded what is to become shared visual memory — rather matured. It and I have already fallen behind. The industry has thundered on to the next level — and doubtless has already in hand the level after that — and I’m just hanging out with a couple of old Nikons, digital and film. Walkabout: Nikon D200, Nikkor 16-85mm VRII, basic filters plus graduated neutral density card (always in the bag), and a carbon fiber tripod. Portraiture: Nikon D2x, Nikkor manual 105mm f/2.5. 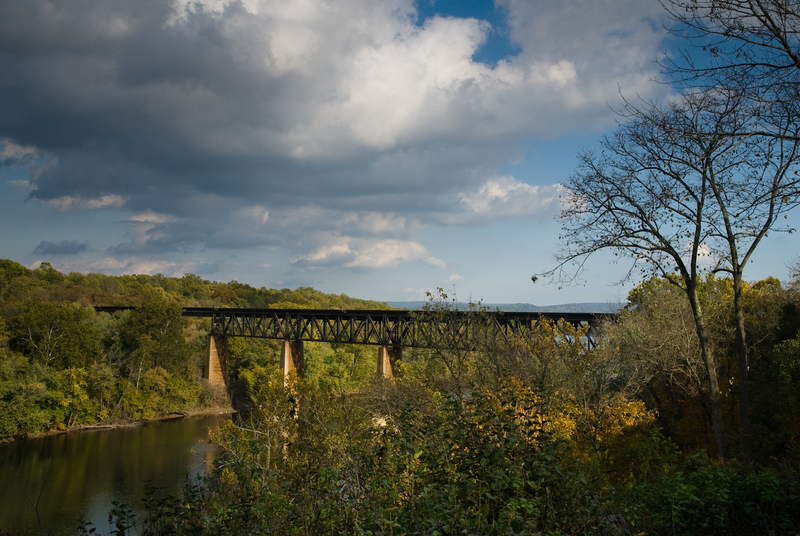 Trestle across the Potomac River viewed from James Rumsey Monument Park. I don’t keep track (as I perhaps should), but the Big Landscape is why I carry the graduated neutral density card.